Looking for gourmet pickles from Bogota? If you are looking for gourmet pickles from Bogota, you've come to the right place. The pickles you are looking for come from a company called Paul's Gourmet Foods, and they are made by a man named Paul Sharpe. These pickles have become a sensation, with people buying them from all over the country. Why are people so crazy over Paul's pickles? Read on to learn more. Paul's Gourmet Foods sells a wide variety of pickles, and his recipes are changing all the time. He's been known to use whatever creative ingredients he has on hand to make up new pickle recipes, and he has become wildly popular for his interesting flavor combinations. If you are curious about what he'll have in stock at any given time, drop in to his shop to say hello or visit his stand at the farmer's market. He also mixes a variety of other ingredients into his pickle recipes, coming up with such creative flavors as wasabi pickles, sesame-ginger pickles and cranberry-horseradish pickles. They make a wonderful addition to your picnic lunch, or try them as a snack on their own. They also make great gifts for the pickle-lover in your family! If you're planning a party, Paul's foods might just be the perfect appetizer for your event. With his wide selection, you're sure to find something your guests will love! Paul's foods have received rave reviews from New Jersey locals and now he is popping up in the press. Online magazine Inside New Jersey recently interviewed Paul, and he shares his pickle-making background and how he became so creative in the kitchen. 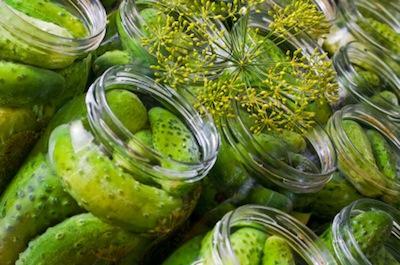 Did you know that it takes seven months to make a batch of gourmet sour pickles? Or that Paul's fans love his pickles so much that they have been given away as wedding favors? New Jersey locals don't joke around when it comes to their pickles, and Paul's is in the prime position to cater to these fanatic folks. Paul has even been featured on "The Pickle Club TV," where you can get a virtual tour of his shop while he talks about how he got started making pickles. The show calls him "The Willy Wonka of Pickles," and it's clear from the video how he earned that name! How Can you Buy Gourmet Pickles? Paul's Gourmet Food also sells online and ships all over the country. If you are interested in buying Paul's gourmet pickles over the Internet, you should visit his website at Paulsgourmetfoods.com.